Bressay looks across the Bressay Sound at Lerwick, stretched out along the shore of Mainland opposite. The stories of the two are deeply entwined. 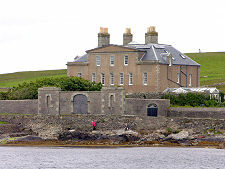 Without the shelter afforded by Bressay, Lerwick would not exist. And without the employment afforded by Lerwick, far fewer that the current 400 residents would live on Bressay. 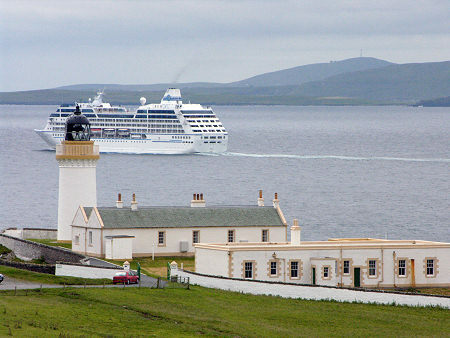 Bressay is linked by a frequent ferry service that takes just 7 minutes to cross to the centre of Lerwick, yet the two might well be a world apart. The irony is that Bressay developed long before Lerwick. The crews of the Viking longships which arrived in Shetland in the 700s and 800s preferred to land in sheltered inlets where the water was shallow. 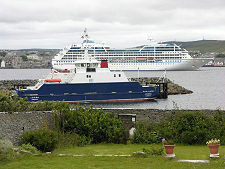 The shore of the Lerwick side of Bressay Sound has very limited landing opportunities. But on Bressay the mouth of Leira Voe, which translates as muddy creek, was large enough and sheltered enough to allow many longships to overwinter here. It seems likely that Bressay is named after the Norse nobleman Earl Brusi: Brus-Oy translates from Old Norse as "Brusi's Island". Earl Brusi might be less happy if he knew that a rock on the approach to Leira Voe is known as Brusi's Baa, perhaps remembering a navigational mishap the Earl would have preferred to have been forgotten. Five hundred years later, in the 1400s, it was the Dutch who turned to Bressay for their main harbour in Bressay Sound. They operated large twin masted fishing boats called busses, usually accompanied by Dutch naval vessels. Each June up to 2,000 busses would descend on Bressay Sound for the herring fishery: it was said that at times you could cross from Bressay to Mainland by stepping from boat to boat. The herring caught was preserved before being exported throughout Europe. Over time, the annual shanty town that Lerwick became each Summer achieved a degree of permanence. Over still more time it displaced Scalloway as Shetland's capital, and came to attract by far the bulk of development along the shores of Bressay Sound. 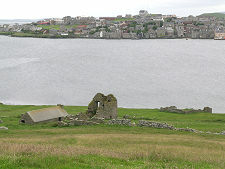 Today the Mainland side of the sound is continuously developed, leaving Bressay to feel remote and rural in comparison. It may not always remain so. 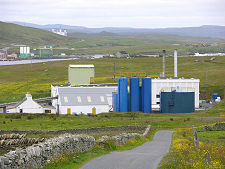 The fish meal factory at Heogan, in the north west of Bressay, already reflects the industry just opposite on the Lerwick side of the Sound. And it has not escaped the planners' attention that at this end of the sound, Bressay and Mainland come as close as 800ft from one another. The result is a proposal for a bridge linking the two. This would inevitably change Bressay significantly. But for the better or worse? Opinions on the island differ sharply. 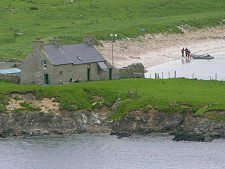 Most settlement on Bressay lies along its western side. 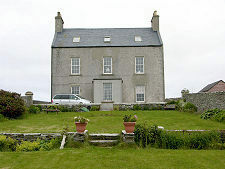 A little to the north of the ferry terminal is Gardie House, dating back to 1724 and one of Shetland's finest lairds' houses. Even closer is Maryfield House, now the island's only hotel and a good option for lunch (though booking in advance is recommended). Meanwhile the large ferry car park is overlooked by the Bressay Heritage Centre. This is well worth a visit for those wanting a better understanding of the history of this fascinating island. 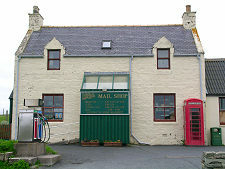 Half a mile south of the ferry terminal is the older focus of the island, at Mail. 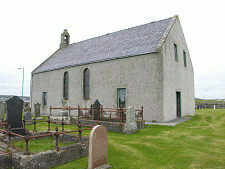 Here you find Bressay Church and the Mail Shop. 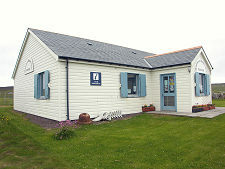 Nearby is Bressay Marina. On one side of this is the pier from which the small ferry to Mainland ran in the days before car ferries: as recently as 1975. 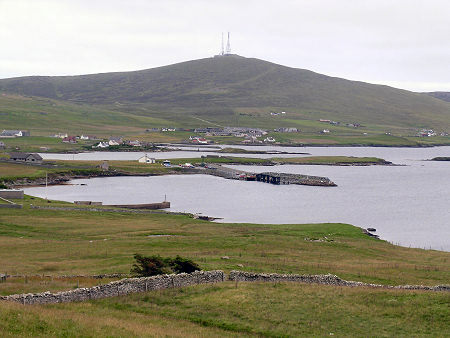 The southern end of Bressay is dominated by the 226m high Ward of Bressay, which with its TV masts can be seen from a surprisingly large part of Shetland. The road in the south of the island here runs along the west coast, and ends at the Bressay Lighthouse. This was built by David and Thomas Stevenson in 1858 and has been a landmark for generations of travellers arriving in Lerwick by sea. 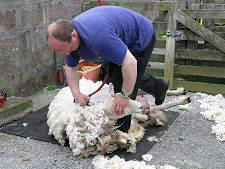 Eastern Bressay is characterised by upland moorlands. Off the east coast is the Isle of Noss. This is a National Nature Reserve run by Scottish Natural Heritage. A small inflatable provides a ferry link to the visitor centre on the west side of Noss.